“Oh look at me I caught a lizard.” I’ve never seen kitties like my kitties who catch things like lizards then eat them. I saw them eating a snake one day. Most of the time they go after big bugs and moths and eat them. 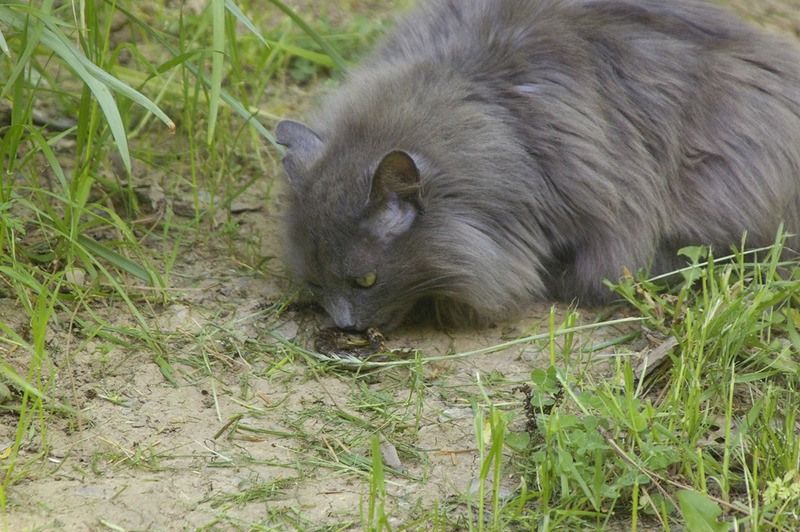 Kitty eating a lizard she caught. 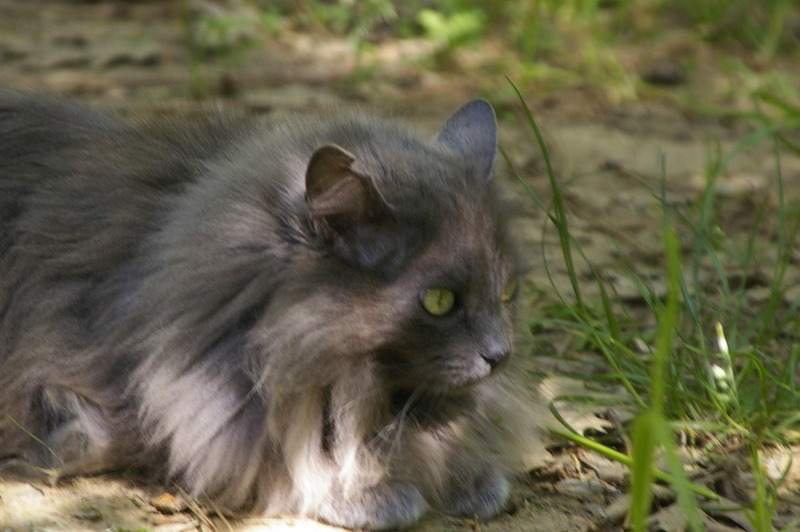 Momma Kitty with her long hair. I just found a large wad of gray hair. I don’t know how she licked it off or if Wheezer licked it off but there’s a large wad of gray fur out on the walkway. My kitties are the only ones I seen climbing trees like they do. They run up a tree like it’s nothing. Then they climb around like they are a bird. I’ve noticed they show off doing things like climbing and darting around. They will look over to see if I’m watching them then start running full speed. I like watching them play chase. They will hide behind a bush and you can clearly see them but they play like you can’t. The other cat will be walking like it doesn’t see them but she does. Then they jump at each other flying over each other and then the chase starts. I’ve never seen cats run as fast as they do. I see thing I’ve never seen house cats do. I’ve never seen a cat swing on a rope hanging from a tree. Yes a rope. She will run full speed and jump grabbing the rope and then swing. Just heard something behind me. I turned to see my little buddy in the house looking for me and a treat. This is the little buddy with the dead tic on her forehead right on the white stripe. I have the doors open to save me from opening them and making noises. The skunks will walk up to the door but this little buddy will follow me into the kitchen. I’ve found her walking around the house and into the bedroom looking for me. When they see me they expect a treat. They are pretty smart too. I can talk to them to get them to come over to me. The only think they have trouble with is other skunks coming to close to them. They don’t mind being around raccoons or the cats. The cats come right up to the skunks and both of them just sniff each other. I don’t call them my pets because saying they are mine when they are wild and pets means I own them which I don’t. All the animals here are free to come and go as they please. I just share the forest with them and most likely the only human they have ever seen. 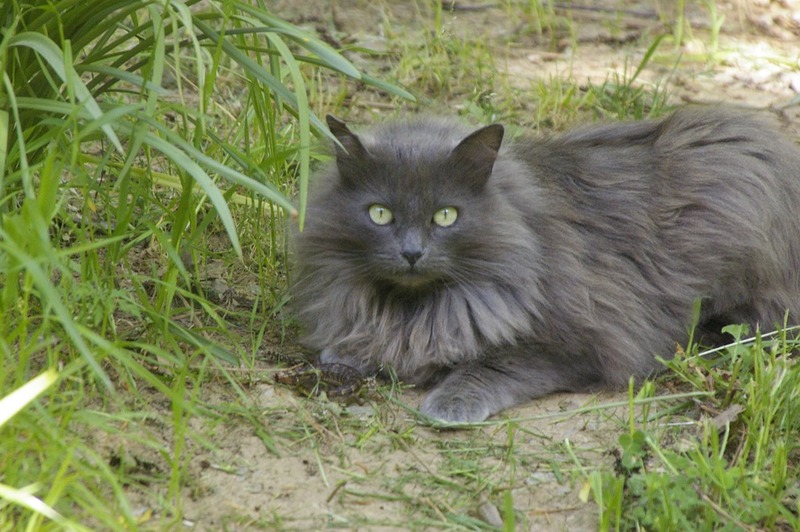 This entry was posted in Nature and tagged cat, Kitty. Bookmark the permalink.